In the 1970s my Mom was given a doll by our neighbors who had acquired it at a German antique shop while vacationing there a decade before. She gave it to me in the 80s and told me it was valuable but I've not been able to find any information about it. The doll has a lovely composite face. The legs and arms are straw (maybe sawdust) stuffed cloth. The body is like a heavy cheesecloth stuffed with straw. The marks I found were very faint so I put a light coating of pencil lead on them to read. Still hard to read though. 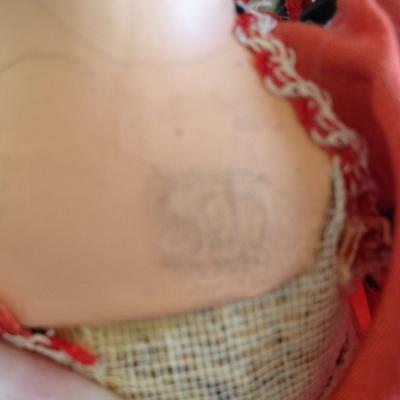 The first mark closest to the neck maybe says: "Bepmany" The epma are somewhat clear, the others I'm guessing at. At first I thought it read "Germany" but I don't think so. The next mark looks like a hallmark below and right of the first, and maybe says "S&h" or "Scb" or perhaps "S&D"
I've included photos and hope that someone of this community is able to help me identify my little German Girl.